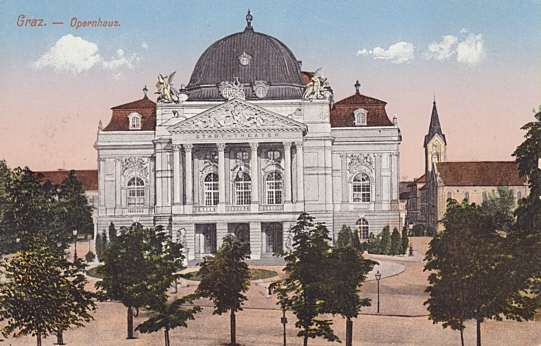 Built 1898-1899 as "Stadttheater" for the city of Graz by Ferdinand Fellner & Hermann Helmer. 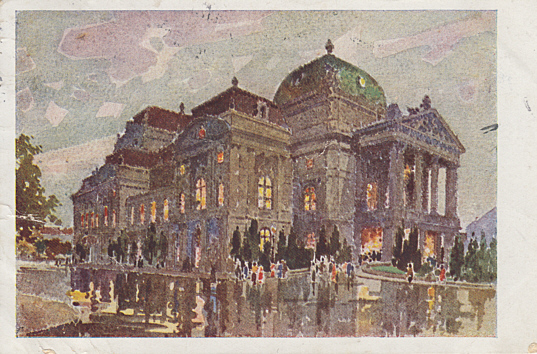 Painted iron curtain by Alexander Rothaug. 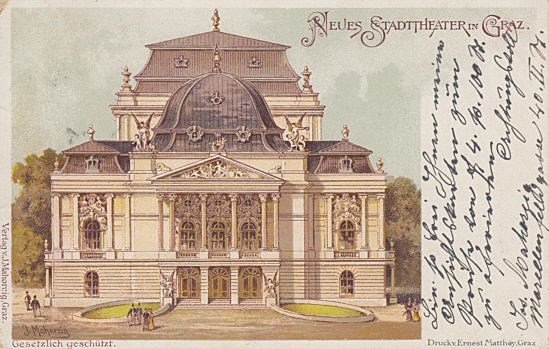 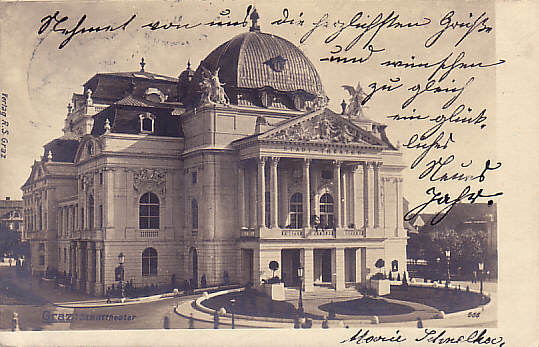 Opened 16 September 1899 with Friedrich Schiller's "Wilhelm Tell" (followed by Richard Wagner's "Lohengrin" on 17 September 1899). 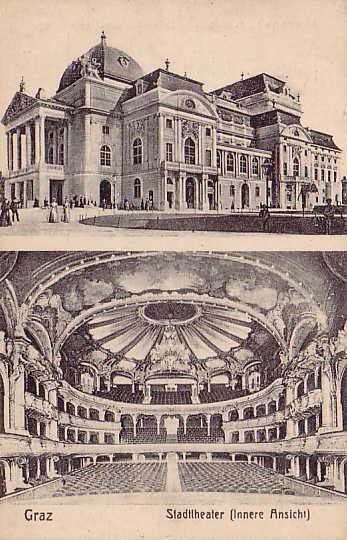 1800 seats (+ 200 standing). 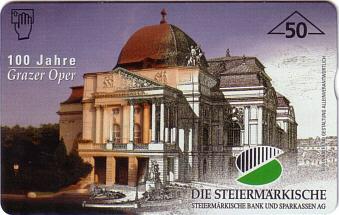 1944 war damages by bombs: destruction of the portico, damages of the dome. 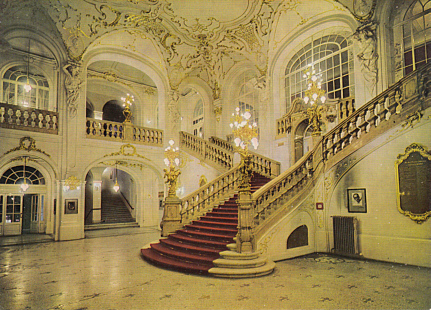 Restored 1945-1948, renovated 1953-1955. 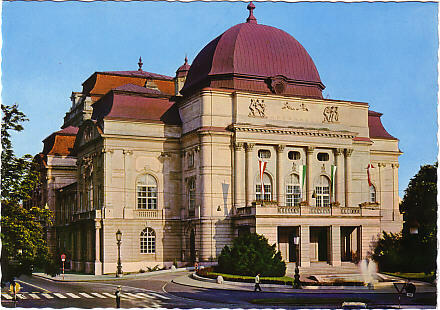 1983-1985 major renovation and extensions, including a new steel and glass skywalk between the theatre and the new stage warehouse (i. e. the stage house of the old Thalia-Theater). 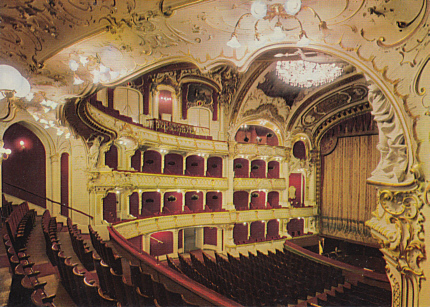 Re-opened 12 January 1985 with Johann Joseph Fux's "Angelica vincitrice di Alcina". 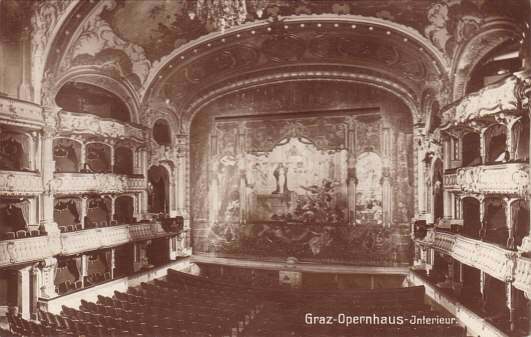 Originally 1800 seats (+ 200 standing), today 1267 seats (+ 100 standing). 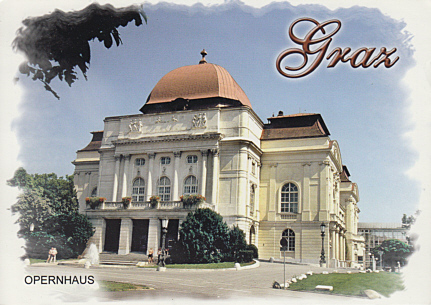 Front Text: "Neues Stadttheater in Graz"
Front Text: "Graz - Stadttheater"
Front Text: "Graz - Stadttheater (Innere Ansicht)"
Front Text: "Graz - Opernhaus"
Front Text: "Graz. 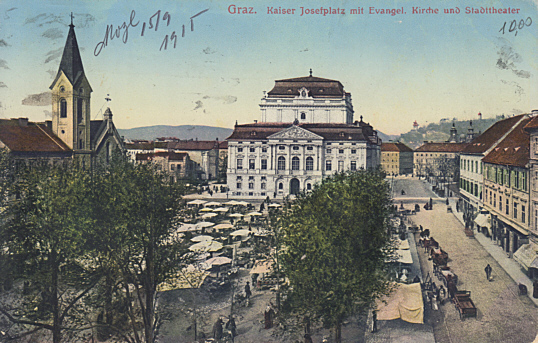 Kaiser Josefplatz mit Evangel. 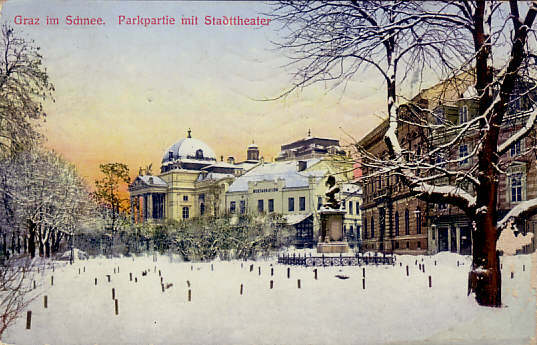 Kirche und Stadttheater"
Front Text: "Graz im Schnee - Parkpartie mit Stadttheater"
Front Text: "Graz - Opernhaus - Interieur"
Reverse Text: "Graz, Steiermark - Opernhaus"
Reverse Text: "Graz - Steiermark, Opernhaus. 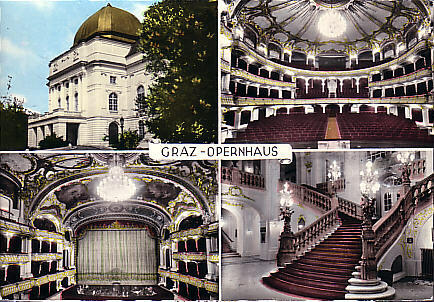 Graz - Styria - The Opera House. 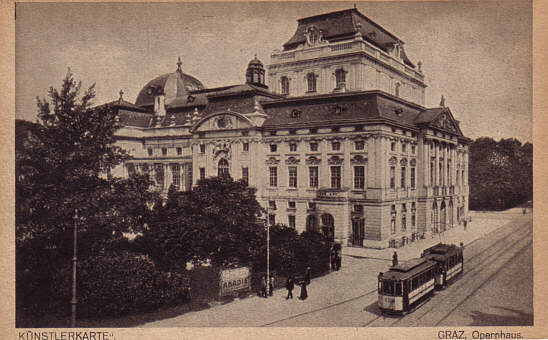 Graz - Stiria, Il Teatro dell'Opera. 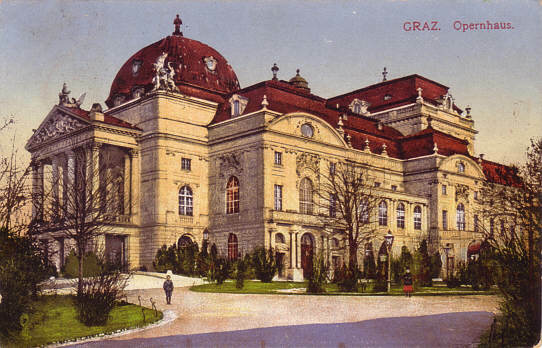 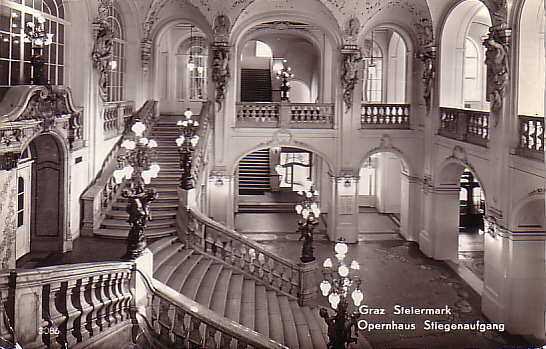 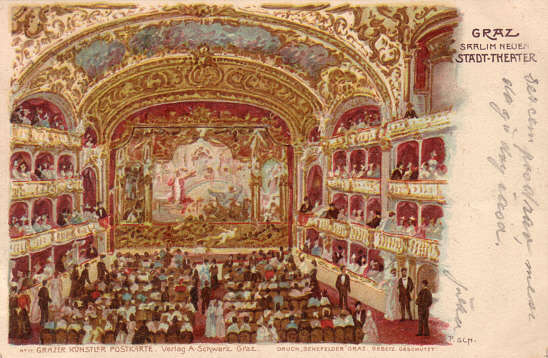 Graz - Stajerska, Opera." 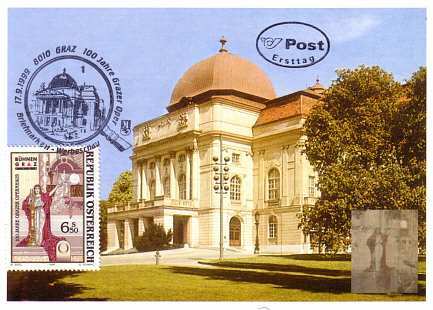 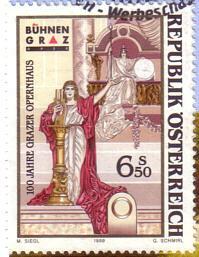 Front Text: "100 Jahre Grazer Oper"
Postmark: "100 Jahre Grazer Oper - Briefmarken-Werbeschau - 17.9.1999 - 8010 Graz"
Reverse Text: "Landeshauptstadt Graz - Steiermark - Austria"